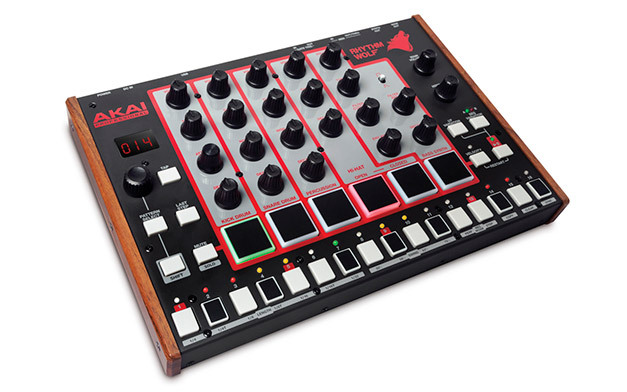 AKAI will show off their new Rhythm Wolf analog drum and Bass synth at the Frankfurter MusikMesse 2014. Rhythm Wolf is an analog instrument that combines the sounds of early electronic and hip-hop music with the wel known Akai workflow. Rhythm Wolf is inspired by classic analog beat machines and synthesizers. The drum machine consists of five highly-tweakable drum sounds and includes a kick, snare, open & closed hi-hat, and metallic percussion. Different controls allow users to change the tuning, amplitude envelopes, and volume of each drum voice separately for precise real-time adjustment. The bass synthesizer features a selectable sawtooth or square wave oscillator, a classic filter design, and a filter envelope with variable decay. Rhythm Wolf has six MPC pads and a built-in 32-step sequencer, it provides a responsive interface with classic drum machine layout. Drum patterns can be fine-tuned using the Swing function, Pattern Select, and Tempo Select knobs. A custom distortion signal path is activated by the ‘howl’ knob. This adds grit and character to your sound. The hardware features USB-MIDI, MIDI In/Out, a gate trigger, and it integrates seamlessly with modern and vintage equipment. • Synth-bass module—selectable square or sawtooth wave with classic filter design for warm, deep basses and squelchy leads. The rumor has it that Rhythm Wolf will cost a meagre US $200, but we couldn’t get this confirmed yet. More information on the Rhythm Wolf synthesizer can be found on AKAI Pro’s website.